Contrary to what the media may have you thinking... here is an uplifting report about values in Denver. Not only have home values increased (despite volume dropping), but CONDO prices seem to have stayed more stable than would have been apparent this year. Christmas Tree Disposal in Denver - Starts TODAY! 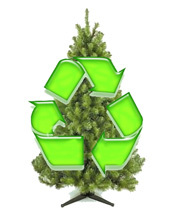 Recycle your tree with Denver Recycles!